In early 2016, a time when millions were not “with her” but “feeling the Bern,” a FBI investigation was started by President Obama, his Attorney General Loretta Lynch and the US Attorney, Eric S. Miller– all of whom are Democrats. For the first time in history, two presidential candidates and their spouses, were under active criminal investigations. The Democrats and their friendlies in the press, want you to believe it was Hillary and Donald. But the truth is, the investigations were into Hillary and Bernie. CNN hasn’t found the time to create headlines regarding the ongoing FBI investigation into Bernie and Jane Sanders, but to wait for that headline, Zucker would have to stop serving nothing burgers. The Democrat Network of Criminals, has a rising star in their long rap sheet by the name of Jane Sanders. 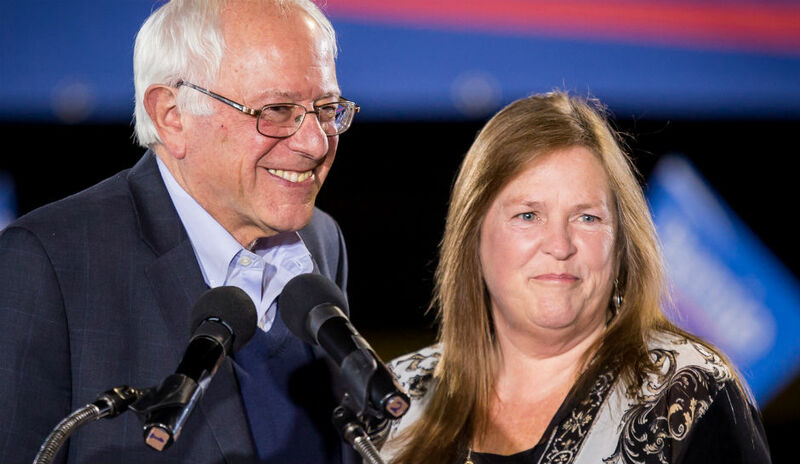 Bernie and Jane Sanders have recently lawyered up in response to an ongoing FBI investigation for federal bank fraud related to $10 million from two lenders: Peoples Bank and the Roman Catholic Diocese of Vermont. The tax-exempt bonds of the loans were issued by the Vermont Educational and Health Building Financing Agency (VEHBFA). In 2010, Burlington College president, Jane Sanders secured these loans by documenting millions in pledges and grants. The problem is, the pledges and grants totalled hundreds of thousands of dollars, resulting in her forced resignation in 2011, after a 7 year tenure. The decision to close Burlington College was “due to the crushing amount of debt” related to these loans. Free College for All? Each student at Burlington College paid $1,000 from their tuition to Jane Sanders so she could jump from this financial inferno with a comfortable $200,000 golden parachute. A fiery lesson in Socialism 101. According to Coralee Holm, the college’s former dean of operations and advancement, the FBI subpoenaed the institution in February 2016 and interviewed Holm on campus at least four times over the next several months. In May of 2016, Burlington College permanently closed it doors. In July 2016, Burlington College was burglarized. According to VTDigger.org, multiple school employees thought that the burglary was an inside job. The van keys were stolen out of an office (for the getaway vehicle). The Burlington College employee whose office the keys were taken from told police she thought it was odd that someone would be able to locate them without knowing where they were stored. Just hours after the burglary, police identified Brett Seglem, 27, as a suspect. He was arrested in Troy, New York, after allegedly backing through a fence in a stolen Burlington College van. According to court documents and the case file, the van was filled with electronics taken from the main campus building, but the hard drive and server were never recovered. Before Corporal Jeffrey Beerworth of the Burlington police department could interview the suspect, Seglem was extradited from NY to PA on an outstanding warrant. From there, the case went cold. Prosecutors in Chittenden County decided they didn’t have enough evidence to place Seglem at the scene of the crime and didn’t pursue charges. Beerworth said he has no solid theories on where the server and that hard drive are. Additionally attempts to locate Seglem have been unsuccessful. The burglary and near bankruptcy of Burlington College may be completely unrelated. Even though many questions remain as to the motive and suspect in the burglary, the Burlington Police Department closed the case. The federal investigation, presumably, without the server and hard drive as evidence, is ongoing. A true, political story with this much intrigue should make headlines and provide Jeffrey Zucker with great ratings, yet the American media remains willingly preoccupied with serving their audience nothing burgers, while putting their duty to seek, find and report the truth on the back burner. This much fire deserves the front burner.